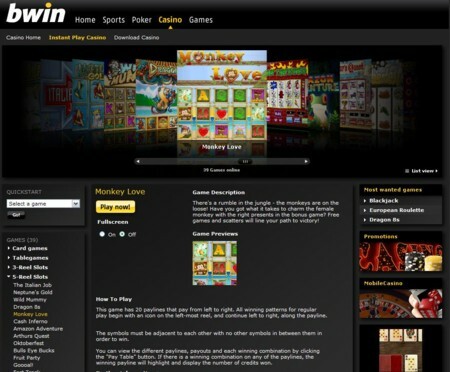 Bwin Casino is part of the Bwin Group which also runs an online sportsbook and an online poker room. Bwin Casino was launched in 2001 making it a fairly well established casino is the online gambling industry. It is licensed in Gibraltar. Bwin Casino has a reasonable variety of games in its downloadable version and also offers an instant flash version so that PC, Mac and Linux users can enjoy the casino. There are a number of bonuses and promotions, as well as a loyalty club available at the casino. Multiple payment options are available and customer support is available via email and telephone. Bwin Casino is powered by Boss Media software for their downloadable version. There is also a no-download instant flash version and that uses software by Chartwell Technology. Players can choose to play in real money mode or fun mode. The software supports play in multiple languages. In total there are 22 different languages English, German offered including Italian, Spanish, Swedish, French, Polish, Danish, Portuguese, Romanian and more. They offer a total of 85 games for players to choose from including table games, card games, 3 reel slots, 5 reel slots, video poker and more. In the flash version of the casino there are more than 30 games available. Games include multiple variations of blackjack, Caribbean poker, baccarat, pai gow poker, red dog, war, American roulette, European roulette, French roulette and craps, plus 35 different slots games. There are 13 progressive games in the downloadable casino and four in the instant flash casino. Bwin Casino offers bonuses and promotions to their new players and existing players. New players at Bwin Casino are eligible for a 50% welcome bonus on their first deposit at the casino up to EUR 250. There are 19 Casino Grand Prix Tournaments over the course of the year. Participants can win EUR 3,000 in each tournament, plus there is EUR 50,000 on offer for the overall leaderboard. Players can become members of the b’inside Members Program. You collect b’inside Market Points and Status Points for every bet that you place at the casino. You collect these points and once you have accumulated enough points you can exchange them for cash or products. If you have any questions when playing at Bwin Casino you can access the FAQ section on their website. If you do not find the answers to your questions in this section, you can contact the customer service team of the casino. They are available via telephone from Monday to Sunday 10:00 to 22:00 GMT+1 and via email every day from 8:00 to 24:00 GMT+1. They can also be contacted by fax. 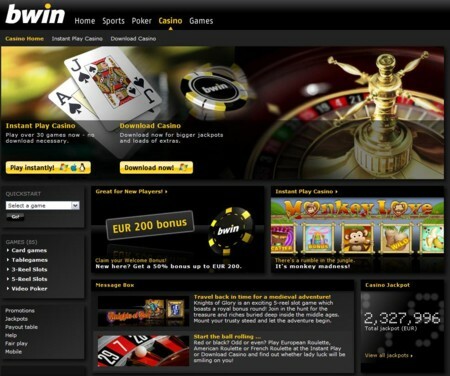 Players can make deposits into their Bwin Casino account via secure and convenient methods. These include VISA, Master Card, NETeller, Moneybookers, PayPal, Click2Pay, ClickandBuy, Paysafe Card, Ukah, WebMoney and Western Union. Players can make deposits into their account in multiple currencies including US dollars, UK pounds and euros.